BooTweak, Other Virtual Intrument from BooTweak Designs. 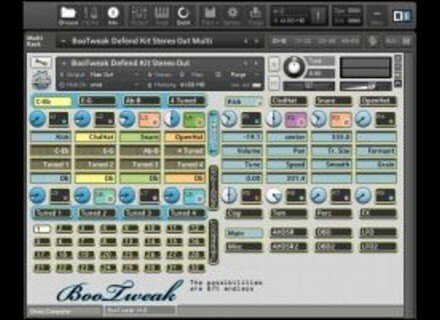 BooTweak Designs has announced the release of BooTweak for Kontakt 4.1+. 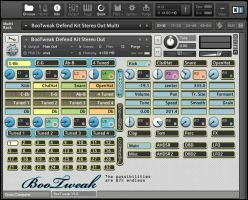 BooTweak is a Kontakt scripted instrument designed as "an uber-template for quickly finding, editing and effecting samples spread across 8 groups." Each group is preconfigured with a rack of insert FX, modulators and modulation assignments. Each instrument is preconfigured with a rack of instrument insert FX and send FX. All parameters are accessible via the custom performance view, which can be controlled with a MIDI controller with scripted controller focus technology. 720 programmed electronic drum samples (44 khz 24 bit .wav files) in 6 separate kits. Controller focus scripting. Access and control the BooTweak interface, 1000+ parameters, with 8 MIDI endless encoders and 13 MIDI buttons. Ghost octaves. Remap sounds to a 2 octave playable, programmable range, selecting notes from 10 octaves. Numerous methods for easily auditioning and finding sounds from across 10 octaves with a MIDI controller and 2 octave keyboard without changing octaves on your keyboard. Innovative group control: relative parameter value changes for multiple selected groups, as well as several group selection and manipulation options not native to Kontakt 4. Patented (1000 patents pending) Platinum (sounds fancy, right?) Invisible (now with visibility.) Pyramid (shaped more like a regular coffin, actually) Preset System (modular, allowing you to change just a few or 1000+ parameters with a button press). The Patented Platinum Invisible Pyramid Preset System. Comprehensive PDF manual and video tutorials already online. BooTweak costs $74.95. A free download of a functional BooTweak instrument is available for download to try out for free. Choosing the Right DAW for You Alfred Music Publishing expands its Pro Audio catalog with Choosing the Right DAW for You, a new DVD designed to help aspiring audio engineers select their digital audio software. Audio Damage Axon v1.1.1 Audio Damage has updated Axon to version 1.1.1. Sonoma Taylor EQ Sonoma Wire Works and Taylor Guitars have teamed up to create and release the free Taylor EQ app: an input EQ for enhancing the sound of a Taylor guitar when played through GuitarJack on an iOS device.